As painting contractors located in Los Angeles, CA many of our projects have included historic restoration of homes, architecturally significant buildings and other prized structures. We work with our clients and city officials to create exceptional results from the planning stage to finish. Many of our restoration projects have been featured in publications, television, movies and other media. Painting ContractorServing Los Angeles and Southern CA. Established in 1988, L.A. 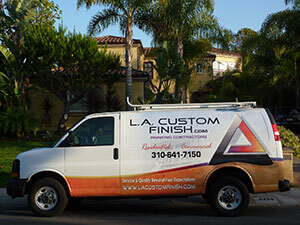 Custom Finish has become a leading painting contractor serving Los Angeles and Southern California. We specialize in interior and exterior painting, cabinet finishing, restoration, faux and specialty paint finishes, elastomeric coatings and wall coverings for both the residential and commercial properties. If you\'re looking for an experienced painting company and painters that know exactly what to do, call these guys. Efficient, responsible, fair prices, and always responsive. You won\'t go wrong - they did my office building, residence and they are now finishing my beach house. They are painting experts. Simply the best out there.